← Look What the Cat Dragged In! Thanks to those who have touched bases and inquired as to my well-being… Recent radio silence a direct result of extreme levels of activity around here!! This image is of Dani and Dad working on the back end of the new mobile farm stand…. 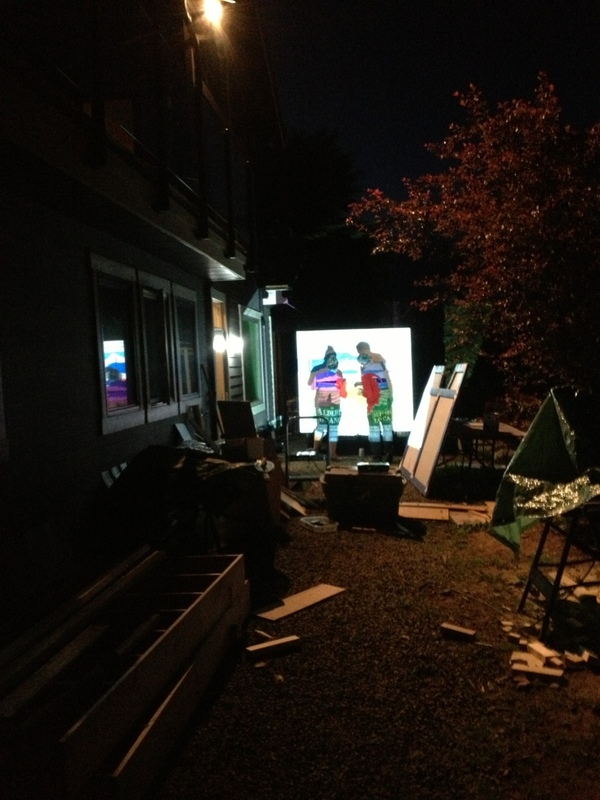 At night… Using a projected image. Full darkness falls at ten pm-ish and they were still out there, beavering away…. Hi Jim! I’ve missed you! It seems you have been quite busy. In good ways, I hope. Yes, we noticed your absence. But it’s spring. On the farm… So … totally understandable. Glad to see you back. What a cool picture! So the market stall I saw at the Festival was the finished product of this? It turned out beautifully! Well, the mostly but not quite finished product… We have a bit of tweaking to do, but it’s almost done!